This is where we use what nature provides to create and consume the home's most vital and varied product: a meal. This is probably the most complex domestic process, which lends itself well to the rigorous discipline of systems analysis. 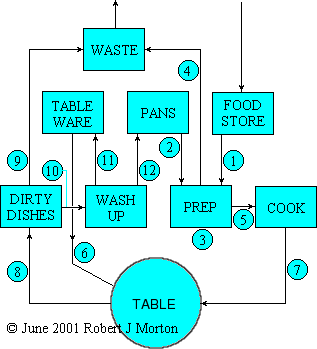 The adjacent diagram models the flow of the processes of preparing a meal, eating it and washing up afterwards. The meal's ingredients are taken from the food store (1). The cooking utensils are taken from the pan store (2). The ingredients are washed and prepared (3). Peelings and other waste are dis­carded (4). The prepared ingredients are put in cooking utensils, which are placed on the stove (5). The table is set with plates, cutlery and other table­ware (6). The meal is served and eaten (7). After the meal, dirty dishes, cutlery and serving pans are cleared from the table (8). Waste is cleared from the plates and pans (9) after which they are washed (10) and put in their res­pective storage units (11) and (12). The main active appliances used in these processes are a cooker and a dish washer. A freezer and refrigerator are also available for food storage. The cooker comprises a three-ring ceramic hob and a separate conventional oven. It may also include a micro­wave or HF oven. An electric mixer or blender may be useful but is not really necessary. I also like to have a toaster. Ideally, two sinks are required. A normal sink is needed for washing large cooking utensils. A smaller sink is useful for washing ingredients when preparing a meal. The diagram below shows a front view of the necessary appliances and storage units. These are arranged in such a way as to minimise the effort and movement required to prepare, serve and clear up after a meal. These 4 1½-metre wide units are in the form of a curve, subtending 90° at a radius of 4 metres from the centre of the Kitchen-Diner module. The units thus fit neatly against the curved wall of the Kitchen Sector. The length of the 90° arc at a radius of 4 metres is (2π/4) × 4 = 2π = 6·283185307 metres. But this is the arc length at the outer surface of the module. To allow for the thickness of the module wall, plus 70 cm for the depth of the work units, the length of the total frontage will be (2π/4) × 3 = 4·71238898 metres. This gives a width of 1·178097245 metres for each of the 4 units. The 1-metre radius round dining table is in the centre of the Kitchen-Diner module, thus making it effectively directly in front of each of the 4 work units. Accessible space exists behind the units for easy connection, servicing, enhancement and re­pair of appliances, pipes and wiring. Water used for drinking and cooking passes through a small scale purification unit beneath the food washing sink on its way to the sink's cold water tap. A physical plan of the Kitchen-Diner module is shown on the left. The focus of the Kitchen-Diner is the two metre diameter round table placed and fixed at the centre of the room. It is shown with 7 chairs. How­ever, there is plenty of space for as many as twelve chairs around this table. The centre of the table can be rotated to facilitate easy access to condements and serving dishes, which stand on small electric hobs. Directly above the table is the room's 3 metre diameter round skylight. This is ringed by small spot­lights for evening. The table and chairs stand on a 6 metre diameter deep-pile carpet. 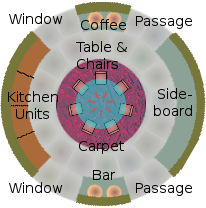 In the Kitchen Sector, at the left of the above diagram, is a plan view of the curved kitchen units. These are equipped with standard fixing bays for the necessary dom­estic appliances: hob, ovens, sinks, and dish washer. 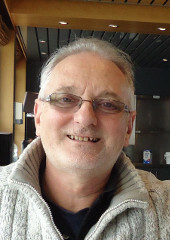 There is a similar arrangement of units in the Food Storage sector. These include refrigeration and freezer units, which are placed here in order to distance them from the heat of the cooking hob and ovens. All non-refrigerated food storage has forced air ventilation. The passage at the upper right on the diagram connects with the Entrance Hall module. The passage at the lower right connects with the Sleeping module. Most food must be grown outside the inner circle of the dwelling because there is insufficient space within. Nevertheless, all herbs and condiments, plus quite a lot of vegetables and fresh leaf plants, can be grown comfortably in the crescent sections of the crop circles that lie within the Central Garden. The soil area of the crop cres­cents has built-in irrigation pipes, which are controlled automatically to maintain the correct moisture level in the soil. All necessary gardening tools and machinery are stored in a ground-level Utility Room below the Kitchen-Diner, which has a direct door to the outside. Much of the Kitchen Garden's harvest is also stored here, while fresh herbs and greens are picked directly from the garden as they are needed for cooking. A small goods lift takes garden produce, as needed, up from the Utility Room to the Kitchen-Diner above. The Kitchen-Diner is a prime example of flexible space. This is because its central 2 metre diameter round glass table is only used for dining for short intermittent durations. The rest of the time, it is free to be used for other purposes. Consequ­ently, it is an ideal place for conference and conversation. The table is shown surrounded by 7 chairs. Upon the table, corresponding to the position of each chair, is a place for a tablet screen. These can be fed via LAN con­nectors around the 2cm deep wall surrounding the recessed rotatable central area of the table. Alternatively, the tablet screens can be connected via WiFi, although this is considered to be less secure. One or more places can also be equipped with a keyboard and mouse. Notepads and pens can also be set out in each of the 7 places at the table. Thus the table becomes a place for conference. The Sideboard, which is diametrically opposite the kitchen units, provides storage around the outer wall of the Kitchen-Diner for books, documents, information media and other necessities for the conference function, including a server computer for the tablet screens.